Can Invisalign Aligners & Retainers Stain? They can. In fact, many patients struggle with the yellowing of their retainers that can occur due to plaque buildup and staining from certain foods. Luckily, there are some small changes you can make to avoid staining your Invisalign trays and retainers. 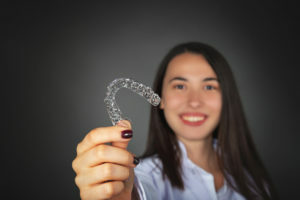 In this post, we’ll walk through some of the things you can do on a daily basis to avoid staining your Invisalign trays, so your aligners stay crystal clear, and all we’ll see is your beautiful smile. Like your tooth enamel, the plastics used to craft Invisalign trays can absorb the colors from the foods and drinks you eat. You can limit your intake of these staining foods, or you can add some extra steps to your daily hygiene routine. After eating, brush and floss teeth to remove any debris. Then, carefully rinse and brush your retainers as well. While eating or cleaning your teeth, you can also store your retainer in a solution of two parts cold water and one part antimicrobial mouth rinse. This not only helps your Invisalign tray stay clear; it also improves your breath. Brush for at least two minutes at least twice each day, and for best results, brush between meals. Brush and rinse your Invisalign trays every time you brush your teeth. Floss at least once each day and take a moment to floss after meals if you notice food stuck between teeth. Use antimicrobial mouth rinses between meals if you don’t have time to brush. This reduces the amount of plaque and helps to eliminate some of the staining pigments from darkly colored foods and drinks. Wear your aligners for at least 22 hours each day to ensure your teeth shift according to plan, and you can move on to the new set of alignment trays as directed. At Celebration Family Dental, we work with patients of all ages to achieve their oral health care goals, including Invisalign orthodontics for adults and teens. Our Carrollton dentists have years of experience providing effective Invisalign orthodontic treatments for patients, and we’re here to help with all of your Invisalign questions and concerns. If you notice changes in the color or shape of your Invisalign tray, please don’t hesitate to give us a call between appointments. In some cases, we can help you address concerns over the phone. When we can’t fix things on the phone, we’ll be happy to schedule an appointment for you to come in to see us. Please don’t hesitate to call us with questions about your Invisalign treatment or to learn more about any of the other preventive, restorative, and cosmetic dentistry services available from our team. Comments Off on Can Invisalign Aligners & Retainers Stain?